Poorboy's World HD Aluminum & Metal Polish is a heavy duty metal polish made to restore shine and high gloss to worn and oxidized aluminum and metal pieces. Apply one small drop to a microfiber towel or soft cloth and spread the product over a small area. Then with light to medium pressure buff the product in and wipe away the excess product with a clean towel. You will be amazed with how it removes stubborn build-ups like embedded brake dust, dirt, road grime, etc. It also removes oxidation and other hard to see imperfections which make your aluminum and metal pieces dull. Poorboy's A&M can be used by hand, or machine if you are looking for that extra bit of corrective power. This polish features no silicone or wax, which makes it body shop safe. Reveal that vibrant shine and make your aluminum and metal pieces pop with the Poorboy's World HD Aluminum & Metal Polish! 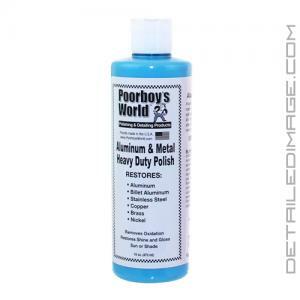 Poorboy's A & M is a heavy duty metal polish made to restore shine and high gloss to worn and oxidized aluminum and metal. Poorboy's A & M can be used by hand or machine, in sun or shade. Poorboy's A & M is silicone and wax free making A & M body shop safe. By hand: Apply a small amount of A & M to a cotton terry towel. Rub A & M in a back and forth motion until a smooth non-binding surface is achieved. Remove oxidized residue with a soft cotton or microfiber cloth. By machine/drill: Apply a small amount of A & M to a wool/foam pad or a wool/foam buffing ball and work into finish. Remove oxidized residue with a soft cotton or microfiber cloth. A & M pulls out oxidation and grime yielding better results with every application. For best results, finish off with Poorboy's Chrome Polish for the highest possible clarity and shine. First this smells amazing! Second its very easy too use and can be used on multiple things! I tried using it on a old piece of aluminum and WOW! In a couple of seconds it made from oxidized and dull into the shiniest piece of trash I owned! By far the best polish I have ever used. I've tried other brands such as white diamond, mothers mag and aluminum polish, megiuars, never dull and blue magic and none compare to this.